The following article provides updated total returns for 30 companies in the high-yield BDC sector. 16 of these companies have beat the S&P 500 since 2014. VIX is rising and BDCs will begin to report Q1 2017 results and investors should be prepared for pricing volatility (opportunities). Since 2014, the average BDC has beat the S&P 500 with total returns of over 20%. Explanation of total returns: The Change in Price assumes you purchased the stock at the end of 2014. Dividends do not assume reinvestment and are calculated using the amounts paid (or accrued) divided by the purchase price. As usual, many of the lower yield BDCs continue to outperform the average including Main Street Capital (MAIN), Golub Capital BDC (GBDC), Goldman Sachs BDC (GSBD), Solar Capital (SLRC), Solar Senior Capital (SUNS), Fidus Investment (FDUS), TPG Specialty Lending (TSLX), TCP Capital (TCPC), Gladstone Capital (GLAD), Ares Capital (ARCC), and Monroe Capital (MRCC). 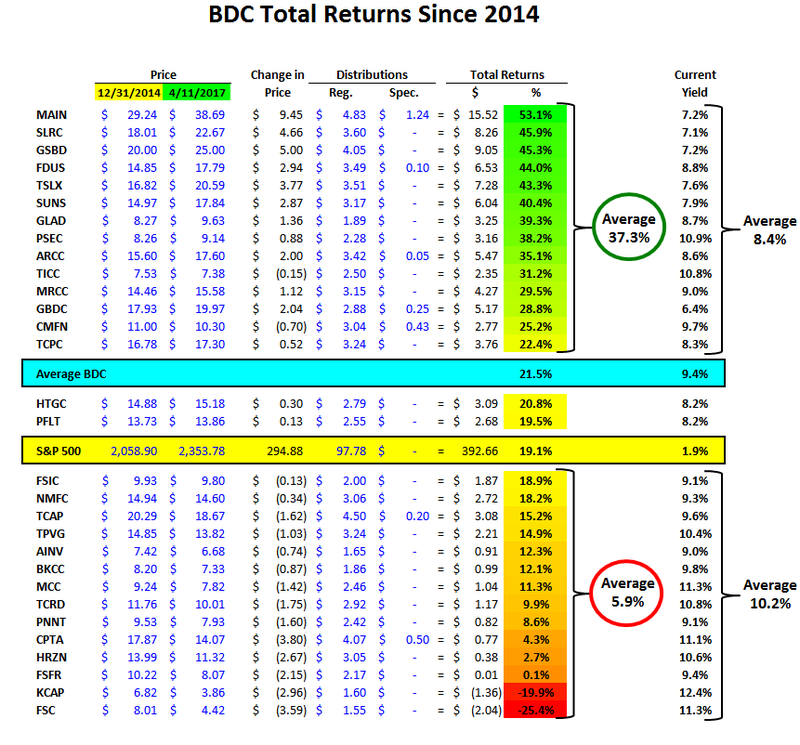 It should be noted that these BDCs have consistently had lower-than-average yields, even before the recent rally. TICC Capital (TICC), CM Finance (CMFN), and Prospect Capital (PSEC) had much less capital gains during this period but are higher yield, so total returns are above average. As always, investors should be prepared for BDC price volatility. 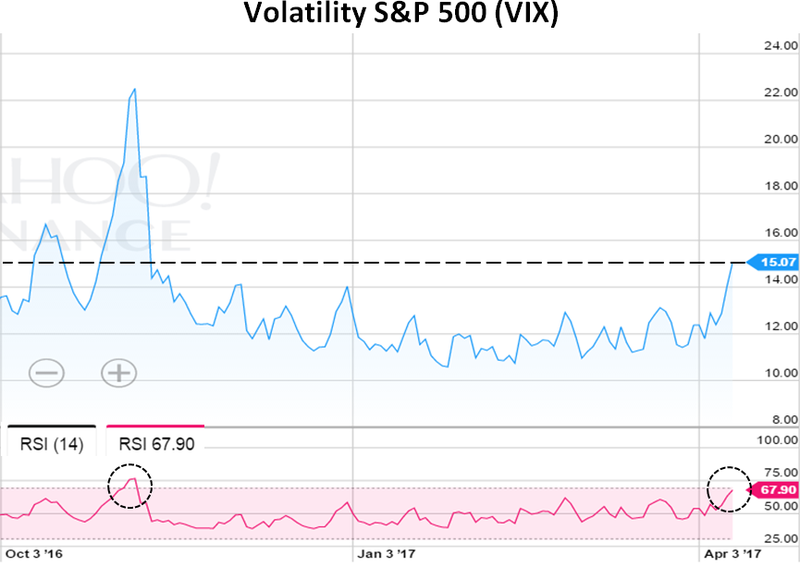 The chart below shows S&P 500 Volatility Index (VIXY) heading toward highs not seen since before the US elections. Also, BDCs will begin reporting March 31, 2017, results in a couple weeks that could spell trouble for certain BDCs likely to cut dividends as indicated in “Assessing Dividend Coverage For The BDC Sector: Part 2.” I will discuss this further in articles next week. Disclosure: I am/we are long ABDC, ACSF, AINV, ARCC, BKCC, FDUS, FSC, FSFR, FSIC, GAIN, GARS, GBDC, GLAD, GSBD, HCAP, HTGC, MAIN, MCC, MRCC, MVC, NMFC, PFLT, PNNT, PSEC, SAR, SCM, SLRC, SUNS, SVVC, TCAP, TCPC, TPVG, TSLX, WHF. I wrote this article myself, and it expresses my own opinions. I am not receiving compensation for it (other than from Seeking Alpha). I have no business relationship with any company whose stock is mentioned in this article.